The interpreter, Igor Korchilov, said the word “verifying” in English, instead of “verified.” Everyone in the White House Cabinet Room froze and turned toward him — including his boss. “To this day, I still feel extremely embarrassed,” Korchilov tells NPR. He worked with Gorbachev from 1987 to 1990. It was a seemingly minute detail. But in the context of these talks, the word “verifying” meant that the Russians had unexpectedly sided with the U.S. on one point in the long-sought agreement. The discussion was on an Open Skies proposal, in which both sides could fly over each other’s territory to verify compliance in arms control agreements. The Soviets and the Americans didn’t agree on whose aircraft should be used for the inspections — the verifying party (the U.S.) or the verified party (the Soviet Union). “At that moment I wished the earth could swallow me up,” Korchilov wrote in his 1997 memoir, Translating History: 30 Years on the Front Lines of Diplomacy with a Top Russian Interpreter. In closed-door meetings at the highest level, interpreters face the pressures of global diplomacy. Every word matters, and a slip-up can have monumental consequences. That’s especially true for the June 12 summit meeting between President Trump and North Korean leader Kim Jong Un. Uncertainty, however, is part of any language. That’s why the best interpreters serve as both linguists and diplomats — they understand the politics behind the words. For those who’ve interpreted top-level meetings, they’ve lived the pressure. 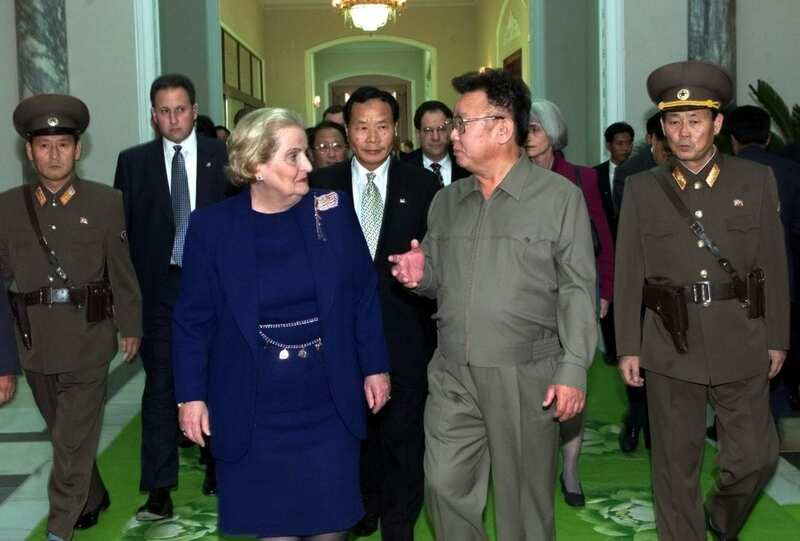 On Oct. 23, 2000, Madeleine Albright, then secretary of state, became the highest ranking U.S. official ever to set foot in North Korea. She met former leader Kim Jong Il, clad in his trademark khaki pants and jacket, at the Pae Kha Hawon state guesthouse in Pyongyang. Albright’s trusted interpreter, Tong Kim, followed close behind. “That was the most important meeting I have ever interpreted for,” says Tong Kim, who served as the senior Korean language interpreter at the U.S. State Department. Albright’s meeting was meant to pave the way for President Bill Clinton to visit Pyongyang, but missile talks between North Korea and the U.S. stalled just as Clinton left office. In December 1983, George H.W. Bush, then Ronald Reagan’s vice president, went on a secret mission to El Salvador. The country was in the midst of a civil war. Stephanie Van Reigersberg, who led the interpreting division at the State Department and specialized in Spanish, was assigned to accompany him. They flew in on Black Hawk helicopters, through the Salvadoran mountains to a presidential villa. Only a handful of U.S. officials knew about the vice president’s planned meeting. Bush was there to deliver a warning to a group of military commanders about the government’s brutal death squads. “The whole military senior staff was there and they all had weapons on their laps,” Van Reigersberg recalls. “Basically, he cussed them out,” Van Reigersberg says. “We were just agonizing over this word ‘adversaries,'” said Dimitry Zarechnak in an interview with NPR in 2001. He was interpreting the president’s speech that day. The Russian word for “adversaries,” protivniki, sounds similar to a word that means “disgusting,” protivniy.